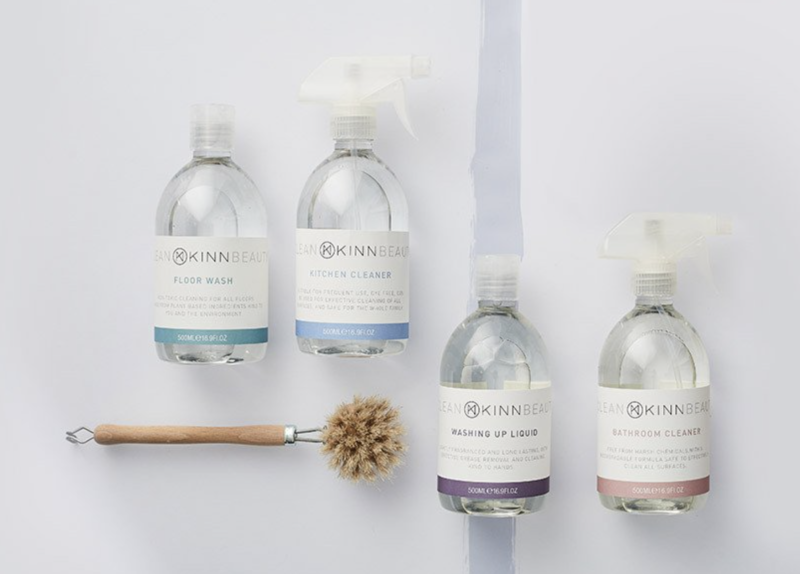 I first discovered KINN Living at the Soil Association ‘Careers with a Conscience’ talk (which I wrote about here), where I received a gorgeous sample of their body oil. After following their Instagram page, fawning over their beautiful posts, and falling in love with their ethos, I reached out to them to see if they could support my barre class fundraising events. Luckily they were keen to support my efforts to raise awareness of sustainability-conscious brands, so the attendees of my last event in 2017 (read more here) received a gentle yet refreshing shower gel. This is now my favourite shower gel for every day use, leaving you feeling soft, clean and ready for the day ahead! Hey Marie, Sophie, how are you both? What have you been up to lately? Hi Zara. We’re really good, busy with lots of planning. Our home range launches into Waitrose next month so we’re excited about that and we’re working on bringing out a couple more ranges later in the year. How exciting! So together you founded KINN Living – how did it all begin? Marie – KINN originally began when I had just had Sophie. The typical cliché – I was looking for products that I thought would be best for my new baby. My searches for natural and organic products came up empty, so I decided to take matters into my own hands. My uncle had a company in The States selling aromatherapy-based products and I thought that those would be great to bring to the UK. However, for one reason or another, I ended up having to shelve the project. Sophie – So when I started uni I had no idea what I wanted to do, but I knew that I wanted to work for myself. I could see already that the clean living lifestyle was a growing trend and that’s when I thought about my uncle’s company (no longer trading) and the products my mum had tried to develop in the 90’s. After a lot of bugging, I managed to convince mum to let me put my degree on hold and we began to work on KINN full-time. It quickly evolved from this idea of selling aromatherapy-based organic products, to this larger variety of lifestyle products and the idea of Clean Beauty™ for you, your family and your home. What did you both do before going into business together? Marie – I worked in property developing and was lucky enough to create everything from bespoke multi-million pound properties to smaller developments such as starter homes. I fell into this career path in my 20’s when I bought my first house with Sophie’s father and decided that I wanted to rip out all of the walls, extend the back, and create an open plan home. Sophie jokingly says that I’m an extreme decorator! Sophie – Before KINN, I was studying English Lit at uni and training to become an interior designer at KLC. I originally thought I would follow my mum into property, but through the interior design route rather than developing. I was lucky enough to have some great work experience that included running a pop-up fine art gallery in Mayfair for two months (art is my first love, having studied Art History at School) and working with the designers who created George Northwoods flagship salon. However, the more I thought about KINN, the more I thought the time was perfect for a company like it to exist! How are you finding working together? What are the best and worst parts of going into business with your mother/daughter? Marie – Sophie is someone that I spend a huge amount of time laughing with, and we’re very alike in many ways, so the thought of building this company with my daughter, who was the main reason I wanted to do this back in the 90’s, made perfect sense! Sophie – I love working with my mum. She’s honestly my best friend and I feel very lucky that we have a relationship that allows us to work together as well as go off on our travels together. I can’t really think of any downsides. I think the only thing is perhaps having that some outsiders find it hard to see us separately as business women, beyond our mother-daughter team. 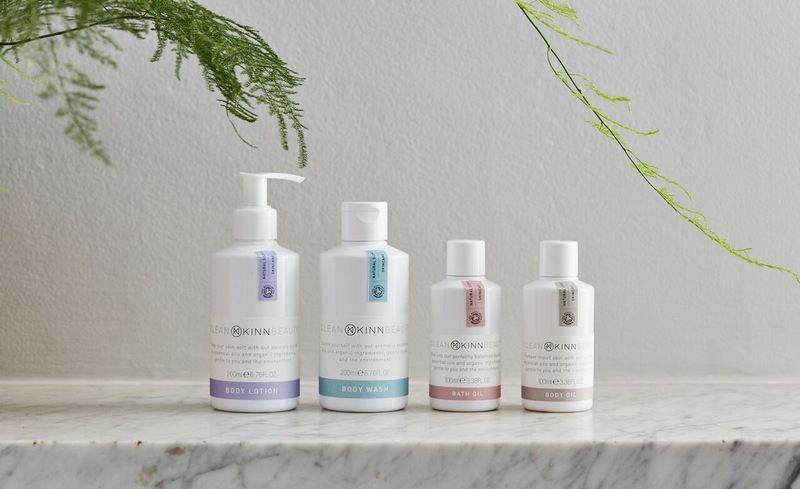 Tell us more about KINN Living and why you wanted to start an organic beauty company? So for us, organic has always just been a part of life and was never a trend or fad. Half of our family come from the South of France and have organic farms. It’s very much the normal thing for us to eat seasonally, to avoid harsh chemicals, and to shop organically. More recently, we started to find that with the growing trend of “clean living” the lines were getting blurred between what was really natural and organic, and what was just greenwashing. We wanted to create a company people could trust wouldn’t greenwash; what we say we are, we are. Marie – When I would be with my grandmother in France, she would send me out to fetch the eggs from the chickens or get fresh milk from the dairy farm across from us. Everything we had was very fresh and simple; we would often pick tomatoes to eat that night. Always searching for organic products, my friends back in the U.K. used to think I was a little bit bonkers, but it just wouldn’t cross my mind to want any other products! Sophie – Like mum, I would go and spend time with my great-grandmother in France, and I would go fetch the milk fresh from the farm or help with the chickens. I spent a lot of time in nature with my cousins and I don’t really remember ever being able to have junk food or sit in front of the television for hours; we were always outside playing on the farms. So again, my friends would think I was a little bit odd when I’d turn up to uni with a bag stuffed full of misshapen vegetables to take home and chocolate mousse made using avocado, but it just wasn’t odd to me! Your ethos is ‘Clean Beauty’ – what does that mean to you? So Clean Beauty™ to us is not just about what you put on your skin, but about what you treat your homes with, what you eat. Why should the notion of beauty only extend to a ‘beauty regime’? Why would we not treat everything else with the same care? We think our homes deserve to have a ‘beauty regime’ of their own that is free from harsh chemicals. After all, we think it’s a little bit crazy to make the effort to have an organic oil filled bath when you cleaned that bath with a load of harsh chemicals earlier that day! Can you tell me more about where your products are made and who makes them? Our products are all made in the U.K.
My uncle (Marie’s uncle, Sophie’s Great uncle), who originally had his aromatherapy company, is the brains behind the body care formulas. He makes sure that the right ingredients are included to stimulate certain feelings when using our products; for example, the lavender in our body oil helps you to relax and unwind. He really is amazing at what he does and is one of the reasons aromatherapy is what it is today! How about where your ingredients are sourced from? All of our ingredients are fully traceable, a prerequisite for the Soil Association COSMOS certification of our body care products. The essential oils come from all over the world and help to support smaller farmers who harvest these crops, choosing to not spray their fields in pesticides. It’s so important to support these people as they have a hard battle with larger conglomerates who try to force them into using their pesticides. You have a huge range of products, from bath and beauty to household cleaning – which are you best sellers and your personal favourites? Marie – I actually find it hard to pick as we’re creating our dream products! I love relaxing with our bath oils, but equally I enjoy starting the day with the body wash. When it comes to the cleaning, I love the smell that the floor wash leaves. Sophie – I am a big fan of the body oil; I use it pretty much daily as it sinks in so nicely and doesn’t leave me sticky and fighting to get my skinny jeans on! 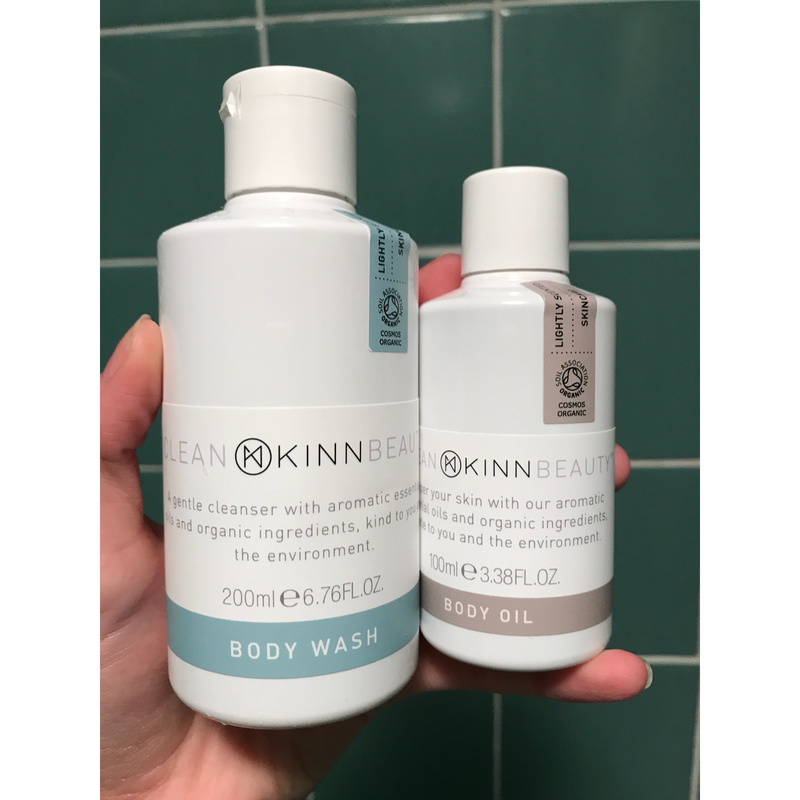 I also love the kitchen spray, I’ve pretty much invaded my boyfriend’s apartment with the KINN products! I don’t blame you – I’m trying to invade my own apartment with them! What plans do you have for KINN Living for the future? We would like to see the range of products KINN Living offers grow so that it really does become a place you can shop, with trust, for products for you, your family and your home. Who knows, maybe we’ll even have our own stores one day! We think the sky is the limit and that it’s just so great that people are really getting behind natural, organic and eco products! For anyone wanting to go organic on a budget, what would you suggest? For beauty, we would suggest that they look out for products that are Soil Association certified. There is currently a real problem with companies greenwashing on their labels, saying they’re organic when really their ingredients aren’t. They can get away with it as there are no labelling laws for ‘natural’ or ‘organic’ products in the UK yet. With cleaning products, look out synthetic fragrances and products using unnecessary ingredients such as dyes and sodium lauryl sulphate. Finally, what are your top tips for shopping with people and planet in mind? Try to support smaller businesses rather than rushing straight to a large chain brand – some supermarkets are really great at championing the little guys on their shelves. We know it’s not always easy, especially when you don’t live in a large town. Thank you Marie and Sophie!